At the New Vic: Confusions and Hero’s Welcome (Stephen Joseph Theatre). Theatre credits include: The Gruffalo (Tall Stories); The Jungle Book (Watermill); His Dark Materials (National Theatre); The Life & Adventures of Nicholas Nickleby (Chichester Festival Theatre, Gielgud Theatre, West End and Toronto); The Heart of Robin Hood, The Christmas Truce (RSC); His Dark Materials (Birmingham Rep); Hitler’s Canary (Watford Palace Theatre); The Cat in the Cupboard (Little Angel Theatre); Love’s Labour’s Lost/Love’s Labour’s Won (RSC, revived at Chichester Festival Theatre, transferred to Haymarket Theatre, West End); The Cherry Orchard (Union Theatre); Uncle Glen’s Managerie (Arcola Theatre). Television credits include: Grandpa in My Pocket (Shrinking Cap Productions); Blank Canvas (Red Wire Media); Cul de Sac (Working Title); The Office (BBC TV). 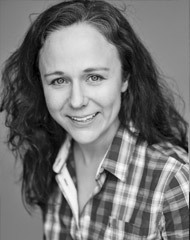 As a Producer, Emma has worked with the National Theatre on Moving Stories. She was awarded the 2017 Olwen Wymark Theatre Encouragement Award by The Writer’s Guild.